President Steve Johnson will retire in August 2018. Viera, FL – March 29, 2018 –The Viera Company announced today the approaching retirement of President Steve Johnson on August 31, 2018. 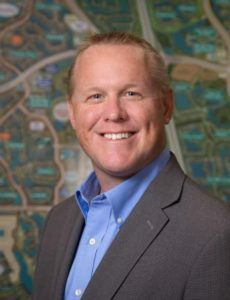 Assuming Johnson’s responsibilities for The Viera Company will be Todd J. Pokrywa, Senior VP land use planning & development as of September 1, 2018. Johnson joined The Viera Company in 1989 and served as The Viera Company’s president from 2005 – 2018. Johnson initially joined The Viera Company as a financial analyst and rose through the ranks as a division vice president and chief operating officer before becoming president. During his time as president, the master-planned community of Viera grew from an estimated 14,000 residents to over 23,000 residents today. As President of The Viera Company, Johnson was repeatedly recognized by the community for his dedication and strong leadership over the years and his involvement with the Home Builder and Contractors Association of revard, as an Economic Development Council board member and as an active member of the Civilian Military Council. Over the past four years, Pokrywa has been working side-by-side with Johnson. 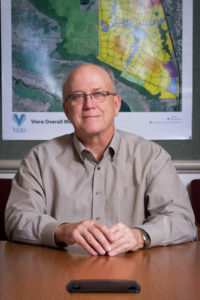 Having written his thesis on the master-planned community of Viera and with 23 years in the land planning and development field, including previous experience overseeing long range and strategic planning at the master-planned community of Lakewood Ranch, Pokrywa came to The Viera Company for the purpose of eventually transitioning to president of the company. As part of the succession plan, Pokrywa has been slowly assuming many of Johnson’s responsibilities over the years in the business, community and with government relations to ensure a smooth transition. Johnson will retire from The Viera Company after 29 years of service on August 31, 2018, at which point Pokrywa will assume the role as president of The Viera Company. Johnson’s continuous devotion to the community of Viera has helped shape it into the top 25 best-selling master-planned community in the country that it is today. A. Duda & Sons, Inc. and The Viera Company will be forever grateful for his service.